Release Date: October 30th, 1999. First DanceDanceRevolution game to use KONAMI's System 573 Digital hardware. DanceDanceRevolution 3rdMIX features a new opening video. First DanceDanceRevolution game to have the BEMANI logo displayed during the opening credits. First DanceDanceRevolution game to have the announcer saying the game title on the title screen. First DanceDanceRevolution game to show a caution message (about danger of violent/extreme playing motion) after pressing the Start button. The interface received new graphics and some of the text placement is different. One of the most notable change is that the currently selected CD artwork is now shown from the front. The LIFE GAUGE now features 17 bars in a pill shape instead of 42. First DanceDanceRevolution game to include a character select screen. Prior to 3rdMIX, the characters were set by default with 2 alternative duos using input codes. A total of 8 new characters were addded to the game. In-game, characters are grouped in pairs, one being for Player 1 and the other for Player 2. Every character from the past two arcade versions are also included except for KONSENTO:02 and OSHARE-ZUKIN:02. First and only DanceDanceRevolution game to feature SOFT mode. This mode removes tougher steps from part of each chart until using LITTLE (later known as CUT on ON1). This mode allows only 1 song to be played. First DanceDanceRevolution game to introduce NONSTOP mode, which features courses containing four selected songs each. It has been used in every DanceDanceRevolution game, excluding 5thMIX to DDRMAX2, until its removal in DanceDanceRevolution (2013). Introduces UNISON mode, in which both players share one playfield and must hit arrows corresponding to their color: red for 1P, blue for 2P, and yellow for both players. If one player does not hit one of their exclusive arrows, the other player can "save" them by hitting it. The COUPLE PLAY style was removed in the main game with UNISON replacing it. However, COUPLE is still available in the 2ndMIX mode. DanceDanceRevolution 3rdMIX itself. The available play modes are SOFT, MEDIUM and NONSTOP. Only BASIC and ANOTHER difficulties are available. MEDIUM includes only the new songs from 3rdMIX. DanceDanceRevolution 2ndMIX, which uses songs from DanceDanceRevolution and DanceDanceRevolution 2ndMIX with 3rdMIX's interface, including the character selection. All difficulties are available using either the EASY (3 songs) or HARD (4 songs) mode. Step Step Revolution, which is identical to 3rdMIX mode but only features SSR (formerly known as MANIAC) difficulty. Additionally, the FLAT noteskin is enabled by default; VIVID must be enabled with a code. The play mode for this game is named TOUGH. MANIAC difficulty retains its old name in 2ndMIX mode. First mainline DanceDanceRevolution game to introduce charts with a difficulty level of 9 (on the classic 1-10 scale). The level 9 rating first appeared in DanceDanceRevolution 2ndMIX CLUB VERSiON 2. Prior to that, an 8 was the highest level found in the game. First DanceDanceRevolution game to have Double MANIAC charts. Only new songs have Double MANIAC charts. 4thMIX was the first game to add Double MANIAC charts for pre-3rdMIX songs. The 2ndMIX STEP BATTLE charts were removed, but the three STEP BATTLE songs are back with normal charts. No songs from the CLUB VERSiON 1 and CLUB VERSiON 2 were carried over to 3rdMIX, instead 4 remixes by AMD were added. First DanceDanceRevolution game with song removal. The Japanese version. The default song is XANADU. DanceDanceRevolution 3rdMIX VER.KOREA, which lacks Stomp to my beat, LOVE, TUBTHUMPING, GET UP (BEFORE THE NIGHT IS OVER), GET UP AND DANCE, IF YOU CAN SAY GOODBYE, and XANADU, but includes 7 Korean songs. The default song is BA KKWO. DanceDanceRevolution 3rdMIX Ver.KOREA2, which adds 9 more Korean songs. The default song is SHOCK. 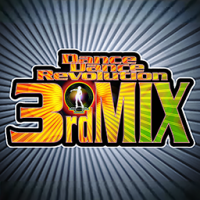 A version of DanceDanceRevolution 3rdMIX intended for the rest of the Asian market, lacking both the songs that were cut from the Korean versions as well as any Korean songs. The default song is UPSIDE DOWN. First DanceDanceRevolution game with the VIVID noteskin, in which arrows have different color cycle timings depending on how on-beat the arrows are. It is enabled by default, except in SSR mode, where it requires a code to be activated. Only DanceDanceRevolution arcade game along with its PLUS version to display the song credits (only for 3rdMIX songs with vocals) in-game, under the "READY" message before a song starts. However, credits for some KONAMI original songs (such as DYNAMITE RAVE and DROP THE BOMB) are displayed as "KONAMI Presents". First and only main DanceDanceRevolution arcade game to feature karaoke lyrics on-screen. Also, it is the only DanceDanceRevolution title until DanceDanceRevolution UNIVERSE3 to have lyrics for KONAMI originals. First DanceDanceRevolution game to change the scoring formula. From this version on, almost every version had a different scoring formula until DanceDanceRevolution SuperNOVA2. Only DanceDanceRevolution game wherein a player using play style SINGLE can be switched at any stage to UNISON. ROULETTE selection was removed. It returned in DDRMAX. Songs with a * are not included when playing using 1 credit. The difficulty listed only apply when using the 3rdMIX Mode. In STEP STEP REVOLUTION MODE, all songs will be set to SSR/MANIAC difficulty. Not included in the table are two courses CAPRICE and ROULETTE which both have the first and second song on BASIC and the last two are set as ANOTHER. CAPRICE songs are selected randomly by the game but the player will be able to see the selection before starting while ROULETTE songs will be kept hidden from the player until they have to play them or songs will be picked at random during the game. Another course can be created when loading a MEMORY CARD to the cabinet, the order of the songs are selected by the memory card. For the codes, the Left and Right buttons refer to either P1 or P2 yellow selection buttons found on the cabinet. The Start button is the green button, also on the cabinet. The foot panels is the dance platform with the 4 arrows. 3rdMIX: After payment and before pressing the Start button, press Left Right Left and then Start. STEP STEP REVOLUTION: After payment and before pressing the Start button, press Left Left Left Right Right Right Left Right and then Start. 2ndMIX: After payment and before pressing the Start button, press Left Left Right Right and then Start. SINGLE, VERSUS, UNISON, DOUBLE: Press the Start button while holding down the Left and Right buttons when the game start. A pop-up menu appears with the play style options. AFRO & LADY, KONSENTO:01 & OSHARE-ZUKIN, DISC-A & DISC-B, DREAD-SNAKE & JANET: During the dance character selection, press the ↓ on the foot panel to reveal the alternative character duo. BASIC: During the song selection, press ↑↑ on the foot panel to change the difficulty to BASIC. ANOTHER: During the song selection, press ↓↓ on the foot panels. MIRROR: During song selection, input ← → ← → ← → ← → using the foot panels. RIGHT: During song selection, input →→→→→→→→ using the foot panels. LEFT: During song selection, input ←←←←←←←← using the foot panels. SHUFFLE: During song selection, input ↑ ↓ ← → ↓ ↑ → ← using the foot panels. NORMAL, HIDDEN, SUDDEN, STEALTH: During the song selection, switch between the options (NORMAL → HIDDEN → SUDDEN → STEALTH → NORMAL) by pressing on the foot panels ↑ ↓ ↑ ↓ to go from one setting to the other. LITTLE: During song selection, input ← ↓ → ↓ ← on the foot panels. FLAT: During song selection, input ←←← →→→ on the foot panels. VIVID: During song selection, input ← → ←← →→ ← → on the foot panels. Read PAINT EDIT data: When "リンクを開始します" is displayed on the screen, to read the memory card, hold down the Left and Right Selection buttons. Use PAINT EDIT data: Press the Left or Right Selection buttons during play. Access KONAMI EDIT DATA (with flashing squares) or EDIT DATA from Memory Card: Hold START button after selecting a song. Display lyrics: Press the Start button during play. gentle stress (AMD SEXUAL MIX): Play using BOLDO & TRACY or AFRO & LADY. GRADIUSIC CYBER (AMD G5 MIX): ASTRO & CHARMY or DISK:A & DISK:B. This section was adapted from Aaron in Japan. The scoring system for the 3rdMIX was changed from the one used in DanceDanceRevolution to DanceDanceRevolution 2ndMIX. One of the main changes are that the score is not determined by large combos anymore and that the maximum possible score for one song is 10 000 000. This scoring system was used to all the related 3rdMIX releases only. This include 3rdMIX PLUS and the two Korean versions and even DanceDanceRevolution USA as it was based on the 3rdMIX. N is the number of steps (notecounts) in the song. If the life bar becomes depleted, but the song continue to play (due to Versus mode or Autofail set to off), the Base Step Score is replaced by 1. This formula will gives its full bonus value if the step was a Perfect, half of it for a Great and 0 for a Good or worst. The Grade is calculated with a different formula using Dance Points. Each step in the song has a value of two Dance Points assigned to it. When adding them all up, the result is the maximum number of possible "Dance Points" for the song. This equal to 2 × N. N still being the number of steps in the song. A grade of SSS through S override any other grade. For a score with less than 80% of the maximum Dance Points, but with a Full Combo, the S grade overrides the B. Likewise, for a score with no Full Combo, the highest grade possible is an A.